These cute little egg candles are fun to make and are a great table centerpiece or festive decoration for the Easter season! Get the kids involved and maybe even let them decorate other eggs at the same time! Start by poking a tiny hole in the top of your egg with a sharp object, like an awl or paring knife, and carefully chip away the top of the egg until you have a nice wide opening. Wash out the inside of the eggs, and let them dry while preparing the dye. Combine 2 Tbs. 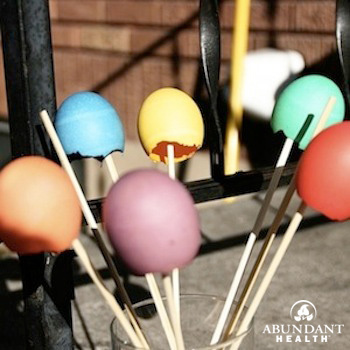 of white vinegar, 1 cup of boiling water, and 10–20 drops of your desired food coloring in a disposable paper or plastic cup (or other container that you are okay getting dye on). Submerge the eggs in the dye for 1–20 minutes, until you obtain your desired color. Let the eggs dry. We dried our eggs in the sun on bamboo skewers in a vase, as pictured to the right. While the eggs are drying, melt your beeswax in a double boiler on the stove. A Pyrex measuring cup in a pot of boiling water works great for this (and the measuring cup makes it easy to pour the beeswax later). You will need approximately 1 oz. of beeswax for each egg you make. Mix a few drops of essential oil into the melted beeswax (1–2 drops of oil for each candle you are making). If you want to vary which essential oil you use in each candle, you can add the essential oil after you pour the beeswax into the eggshells. Carefully pour the beeswax into the dried eggshells. Then place your wick in the middle of the eggshell, and let the beeswax harden. You can put your egg candles back in the egg carton to stabilize them while you pour the beeswax and insert the wick. 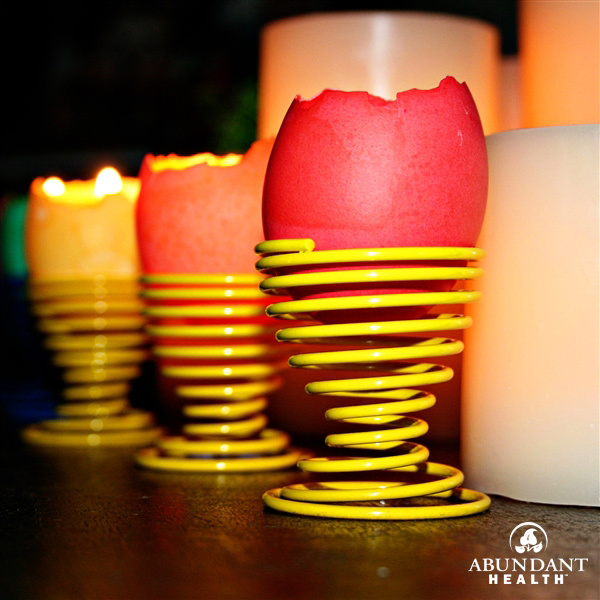 Once the beeswax has hardened completely, move your egg candles to egg cups or any decorative container that will hold them upright. Enjoy your beautiful Easter creation! These eggshell candles look great as a table centerpiece or as a decoration on a fireplace mantle, bookshelf, or anywhere else.